TEMPO™ fabric is hook receptive and very comparable to the VELCRO® brand laminated Loop fabric. It is excellent for displays, exhibits, partitions, wall coverings and much more. 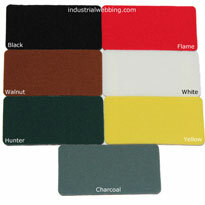 Our Standard stock colors are Black, Charcoal, Flame, Hunter, White and Yellow. We sell TEMPO™ fabric in 1 yard increments. Select "Choose Options" below to select your color and length.